Fine in Fine jacket. Hardcover First printing from this publisher. New/Fine Dust Jacket. 11" high x 9." Wide 9780789315403 NEW OFF OUR WAREHOUSE SHELVES. A Large Hardback with Illustrated boards, in ORIGINAL DUST JACKET, approx: 11" high x 9." Wide. FIRST EDITION, FIRST PRINTING. 208 pages, profusely illustrated throughout with both black-and-white and full color photos, drawings and poster reproductions. BORN IN THE BRONX. A Visual Record of the Early Days of Hip Hop. 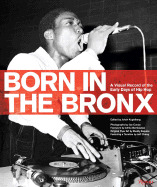 Edited by Johan Kugelberg, Photographs by Joe Conzo, Foreword by Afrika Bambaataa, Original Flyer Art by Buddy Esquire, featuring a Timeline by Jeff Chang.